But what’s actually going on, deep within your car, truck or crossover when it’s time to get stationary? Turns out, stepping on the all-important brake pedal triggers several processes that deploy the power of hydraulics and friction to slow your vehicle down. Read on for a better understanding of how your brakes work: by the time you’re finished, you’ll be able to identify various parts of your vehicle’s braking system, understand what happens between the brake pedal and the brakes and be more interesting at social gatherings. Your brake pedal is connected mechanically, usually via a metal rod, to a device called the master cylinder. The master cylinder is a sealed chamber full of brake fluid, which is a form of hydraulic oil. Brake lines connect the master cylinder to your vehicle’s brake calipers. These brake lines are passageways through which the brake fluid flows. When you press the brake pedal, the metal rod attached to it acts on a piston inside of the master cylinder. This piston compresses the brake fluid inside of the master cylinder, which builds up pressure within the brake system. That pressure is transmitted through the brake lines and provides the force needed to work the vehicle’s brakes. More pedal force means more pressure, which means more stopping power. When you release the brake pedal, the action of a spring releases the piston in the master cylinder, returning it to its resting position and decompressing the fluid in the system. This reduces the pressure in the system, causing the brakes at each wheel to release. Behind each wheel on your vehicle is a braking system component called the caliper, which is like a big clamp. Brake calipers generate clamping force when pressure is applied, via the brake fluid and brake lines. It’s this clamping action that forces the brake pads against the rotor and generates the friction required to slow or stop your vehicle. In a nutshell, when you press the brake pedal, the resulting increase in hydraulic pressure is transmitted (through the brake fluid in the brake lines) to the calipers. This causes the calipers to clamp, which creates friction and stops your vehicle. Some vehicles, and particularly older ones, may use brake drums instead of brake calipers. Though brake drums and calipers are different, they both have the same job: turning hydraulic pressure into vehicle-stopping friction. So far, you’ve learned that stepping on your vehicle’s brake pedal generates hydraulic pressure. You also know this brake pressure is transmitted through a sealed system of brake lines, where it acts on a caliper (or in some cases, a drum) at each wheel. Finally, we know that the caliper (or drum) is responsible for turning that hydraulic force into the friction required to stop your vehicle. But how does that work? It’s simple once you understand just two more components: the brake pads and the brake rotors (sometimes called discs). Brake pads are metal plates with a special slab of friction material attached to them. Each caliper uses two brake pads, one on each of the caliper’s two opposing sides. 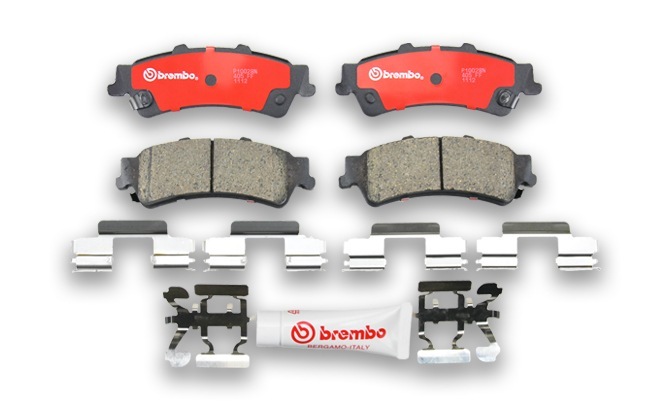 When both brake pads are installed in the caliper, their friction material surfaces face one another. But there’s a gap between the two slabs of friction material — and that’s where the brake rotor fits. The brake rotor is a round, flat and perfectly-smooth metal disc that’s bolted to your vehicle’s wheels, and turns at the same speed they do. The caliper, with its brake pads installed, slips over a portion of that spinning brake rotor. Here, the smooth brake pad surfaces float just slightly above the smooth, rotating surface of the brake rotor. When hydraulic pressure generated by the brake pedal arrives at the calipers, the clamping action begins. This forces the brake pad friction material surfaces towards one another, making them press against the spinning brake rotor from both sides. This generates a tremendous amount of heat and friction, which is used to reduce the speed of the brake rotor, and therefore, the spinning wheels, and therefore, the vehicle. A heavier application of the brake pedal generates more hydraulic pressure, more clamping, more friction, and faster stops. Release the brake pedal, and the hydraulic pressure is reduced. This causes the calipers to release their clamping action, and the brake pad friction material to move away from the spinning brake rotor, releasing the brakes. If your vehicle has brake drums, the process is the same, but the components are different. With brake drums, hydraulic pressure presses the friction material on a part called the brake shoe (the equivalent of a brake pad, in this example), against the rotating inner surface of a brake drum (the equivalent of a brake rotor, in this example). So, How Do Car Brakes Work? Put it all together and here’s how car brakes work in a nutshell: drivers generate hydraulic pressure by pressing the brake pedal, and that pressure travels to the brake caliper (or drum) at each wheel, where it’s used to drive a friction material into a spinning steel surface that’s connected to each wheel. The resulting friction is what slows your car or truck down. And now you know! 4 responses to How Do Car Brakes Work? The article does as intended: It covers the basics. The second sentence in the section on "Hydraulic Action" is technically incorrect. The piston does not 'compress' the brake fluid -- as it is a liquid. The force of the piston builds pressure because the liquid cannot compress and is in a virtually closed system. Perhaps a future article could discuss the benefits of cross-drilling or slotting to vent gases or perhaps why increasing disc diameter is associated with improved stopping power. I was hoping to learn what kind of temperatures one would find during normal driving right up to track time. At what temperature will your typical Bimmer brake begin to fade and lose its traction? the units of the Bulk Modulus of Elasticity 'K' are N/m^2 in Pa. Petroleum derivative liquids generally have K ~ 2 x 10^9 Pa, about the same as water. Brake fluid liquid DOES compress, just not very much. Water compresses, but not very much compared to fluids, like gases. The modulus of elasticity of the brake system components is more than the liquid. If you are going to struggle with Bulk Modulus of Elasticity then your explanation of disc brake power will fail to be comprehensible.